Is it possible to be one of the world’s most infamous arms dealers and still be a victim of political persecution? This is one of the questions raised by The Notorious Mr. Bout (“Bout” pronounced “boot,” as in footwear), a powerful documentary made in the vein of other recent investigative pieces that analyze possible government misconduct, such as Deep Web, Citizenfour, and Whitey: United States of America v. James J. Bulger. Mostly edited together from footage captured over the years by its principal subject, Viktor Bout – the model for Nicolas Cage’s character in Lord of War – the movie is briskly paced and even-handed in its presentation of the material. 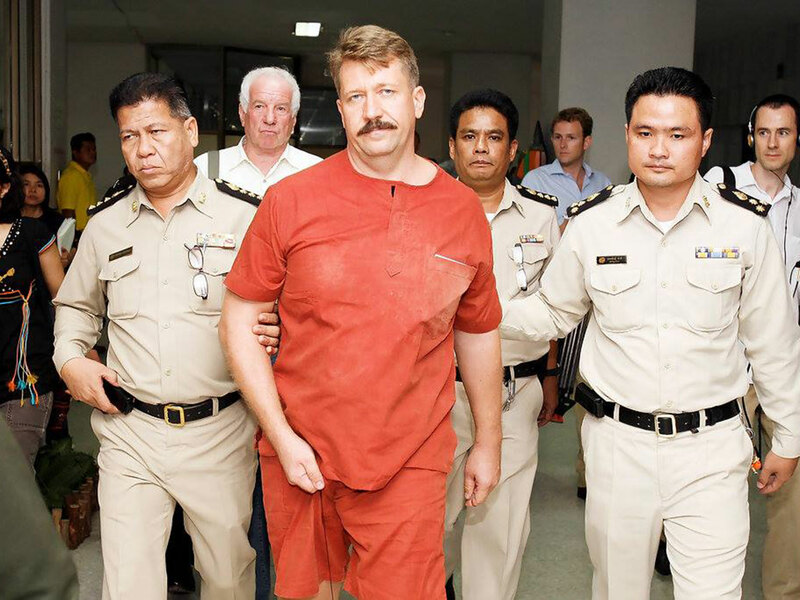 We may ultimately doubt the conduct of the U.S. agencies that apprehended Mr. Bout in Thailand in 2008, but we never for a moment dispute the fact that Bout has done some very bad things in his life. Except that we do see Bout (remember those cameras) in Bulgaria, setting up negotiations between African governments and Kalashnikov factories (looking for new clients after the dissolution of the Communist bloc). Perhaps he’s not so innocent, after all. Or, perhaps, he simply has no moral compass, as numerous talking-head interviewees claim throughout the film. One of these subjects notes that, to Russians raised in the Soviet era, “biznizman” was always synonymous with gangster. If making money is inextricably linked with corruption, and you want to make money, then who cares if your clients are unsavory? After the terrorist attacks against the United States in 2001, however, everything changed for Viktor. The Americans applied enough pressure on Bout’s clients and on the United Arab Emirates – where he still ran his original business – that his business collapsed and Dubai revoked his residency permit, forcing him to return to Russia. No longer so young, nor so fresh, Bout found himself at the mercy of his friends’ charity, unable to make money as he had before. For the next 7 years, he remained out of the international spotlight – with the exception of the Nicolas Cage film and the 2008 book Merchant of Death: Money, Guns, Planes, and the Man Who Makes War Possible. But U.S. Government agents never forgot about him, and their search forms the spine of the movie. The irony is that by the time they caught up to Bout, he had long since ceased to be a menace. That and the fact that they may have engaged in entrapment lend the film its investigative edge. It’s an impressive piece of work. With well-shot interviews and interesting interstitial graphics, the movie lays out its story clearly and without editorial commentary. The voices we hear are Bout’s (voiced by an actor), Bout’s wife, various other family members and business associates, and the DEA agents who caught him. This is a model of how all such cinematic profiles should be compiled, and I highly recommend.